I started listening to Beri Weber with the release of “Thank You Hashem”, which I reviewed. I was initially skeptical because I had never been big on Hassidish singers, partially because I don’t speak Yiddish. Beri Weber has changed all that! He’s got incredible talent, a sweet yet powerful voice, and a unique style that combines the old with the new. I quickly bought Fabreng and later Fabreng Vol 2, Beri Weber’s two acapella kumzitz style CDs. They are excellent sefira music… all the music is pure harmonizing. Not to mention they both have around 50 tracks, half of which are instrumental. So needless to say, I enjoyed “Thank You Hashem” and am excited about the recent release of Ben Melech. Ben Melech has definitely lived up to my expectations. Each song has a unique flavor and the album is done very intelligently. I cannot say enough, also, how beautiful Beri Weber’s voice is. And he sings with A LOT of emotion.He was singing at a wedding I was at a few weeks ago and sounded just as good in person. I really respect how Beri Weber puts his personality onto the album. Some of the songs sound almost theatrical and he occasionally speaks in Yiddish in the middle of the songs. Unfortunately I generally have no idea what he is saying so part of that is lost on me. He goes against convention in subtle ways aside from the songs being different. For example, most CDs these days seem to alternate between slow and fast songs and have the album be half of each. This album starts out with fast songs and the end is mostly slow songs. Overall it is definitely a quality album, though some songs sound out amongst the crowd. -Another Hebrew song about achdus! Good thing I like this style because they are everywhere ! -Exemplifies the album for me with the mix of traditional and modern together. Definitely my favorite fast song on the album!!! Love the chorus…. -The first slow song on the album! Absolutely gorgeous, heartfelt song. The whole song feels very well thought-out , with choirs coming in at the right times, the music going quiet at the right times…perfect. Very moving. Can’t say enough. -Interesting! I don’t think I have ever heard Shehakol as a song! -Has a similar feel as Vashen– swing music! So much fun. This one also brings in the guitars a lot, though. Fun dance song… sounds like a wedding song if not for the lyrics but hey you never know. -I’m not usually one for nigunim.. I’m a lyrics person. But I appreciate their beauty! -This is a traditional nigun with simple traditional music and a choir throughout harmonizing. -Beri Weber hits a lot of great notes here and it will remind you of Fabreng as well! -We get some Yiddish speaking in the middle… close to a minute and a half. I have no idea what he is saying. I think I heard sheifeleh a few times? Probably not.The Tatte! after the speech is worth listening to the speechfor, even if you don’t understand it ! Beautiful song, sounds like he is really pleading with Hashem. 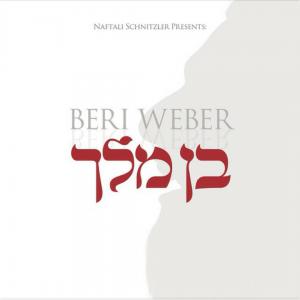 -Love the soft ending– music softens and Beri Weber almost whispers. Perfect ending. -How in the world does he make techno sound beautiful? -The title track is #10 on the album! -It sounds so real- I almost feel like I am spying on his davening! -Beri Weber and Yoelish Klein sound amazing together. I don’t know who Yoelish Klein is, but he was a really neat voice , and I love their harmonizing! Sounds like friends singing together. -Its 6:19, but I can’t get enough of it. Repeat. Another unique song that is essentially a duet between two beautiful but contrasting voices. Another favorite of mine. I find myself listening to this one over and over!